This multi-function speaker lantern is not only a speaker lantern,but also a power bank within 10400mAh capacity. The buit in power source allows you to charge your smart devices whether you are at outdoor or you are on the way to next adventure. Built-in portable wireless speaker with upgraded Bluetooth 4.2 technology which contains low power consumption, stable connection and is appropriate for various Bluetooth-enabled devices. The lantern is buit in 16 pieces LED with 200 lumen.This speaker lantern can be hung inside of a tent,placed on the desk and kept in dark cabinet in your garage to give you light whenever you need.Also it can be used as emergency light when electricity failed. 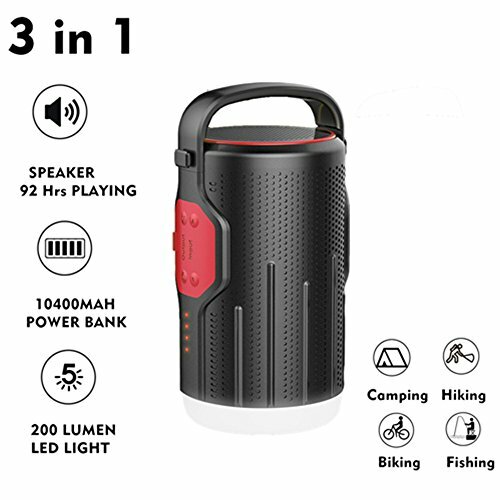 It can last 92 hours when just works as bluetooth speaker in higher volume, 200 hours when just works as camping lantern in lowest brightness, 16 hours when simultaneously works as bluetooth speaker and camping lantern. Only 7 hours for the item to be fully charged. It is a great power backup when camping, hiking, backpacking or doing other outdoor activities.